If you were born in the last 50 years, then you definitely know of the awesomeness associated with LEGO building blocks. One thing that they’re not often considered for is musical instruments, though Mark Crosbie may have opened up a whole new door with the “SoundMachine”: a drum sequencer that creates music using different colored LEGO blocks. The way it works is pretty straightforward: a SoundMachine scanner scans the music from a LEGO plate and transmits it to the computer via USB. The scanner is mounted above a plate made up of regular blue 32 x 32 LEGO base plates and features musical “notes” made up of LEGO 2 x 2 bricks. Each scanner has in it a LEGO Mindstorms NXT that drives a NXT motor to move a plate under an array of 4 LEGO NXT 2.0 color sensors. As the plate moves, the color of the bricks is read, which then gets converted to MIZDI note messages by a controller written in Processing. That then gets sent to Ableton Live to play the sounds. 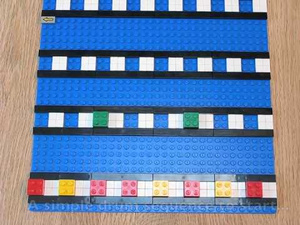 A standard LEGO color sensor detects 6 basic colors, leaving red, yellow, and green to encode the notes which, by the way, are arranged in 4 parallel tracks aligned with the color sensors. The white tiles are used to separate the notes and the sensors use a black reading to detect the start and end of the plate. Since we make the world’s best portable speakers, we have a special place in our hearts for crazy scientists like Crosbie who think outside the box and figure out new ways to merge music and technology.